Talk about guitars, amps and other gear. 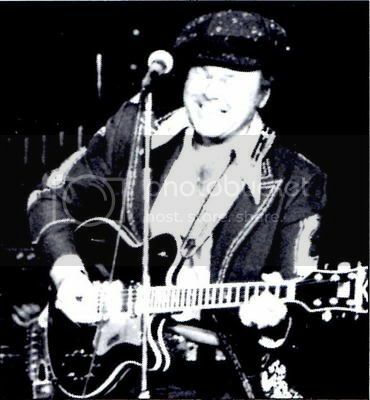 Wonder if that Roy Clark guitar came with one of those hats. Don't think the Chet signature quite made it onto this one? I am happy to report that Chuck has stepped up to the plate to be the "Chet's Gear Guy" for the Chet Atkins Pedagogy Project. 1. Although it is beyond the scope of the Project to deal with gear in and of itself, it is quite relevant to to deal with Chet's gear as it relates to the sound of his final recordings. 2. When it comes to discussing and writing about gear, I am just a little better than useless. I am sure many of you will have lots of info and advice for Chuck. We have posted Chuck's "Chet Atkins Signature Guitars" to get us started. What would be kind of cool is to have pictures of Chet actually holding some of these guitars. However, what is more important is to know whether or not Chet actually performed and/or recorded using a similar model of each and how he may have customized his. Revisiting the Atkins Super Axe and the attempt to change it to the Roy Clark model. 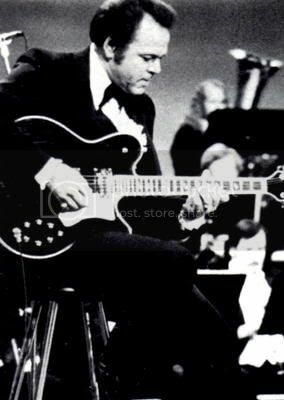 From what I found out, in 1978 Roy Clark was using the Gretsch Super Axe as his main guitar. He began talking to Duke Kramer at Gretsch and Duke wanted to make a Roy Clark model. So Roy wanted a slight V-shape neck, Filter'Trons with split coils to get a single coil sound also. He was thinking about a slotted classical style headstock. He wanted the bass cutaway deeper and the treble cutaway rounded. He still wanted the compressor and phaser, but re-design the physical appearance of the knobs. (they left the plastic plate off). He also had them put a strip of binding on each side of the face of the fretboard. The color was blue. These photos aren't the best quality, but it gives us some more insight to why Chet wasn't very happy with Gretsch towards the end of his endorsement with them in the late 70's. It also makes you wonder what the Super Axe would have sounded like with Filter'Trons instead of the Gibson style humbuckers. I came across these photos of Chet playing one of the Hi-Roller prototypes, before it turned into the Atkins Super Axe, and then just the Super Axe. Notice the dots on the dice inlays. Click on the photos to make them larger.